Somewhere between a large town and a small city, Eugene has a big heart and a lot of personality. This seems to rub off on our people, many of whom have world-class talent and ambition. While some leave Eugene to accomplish their dreams, many others stick around. 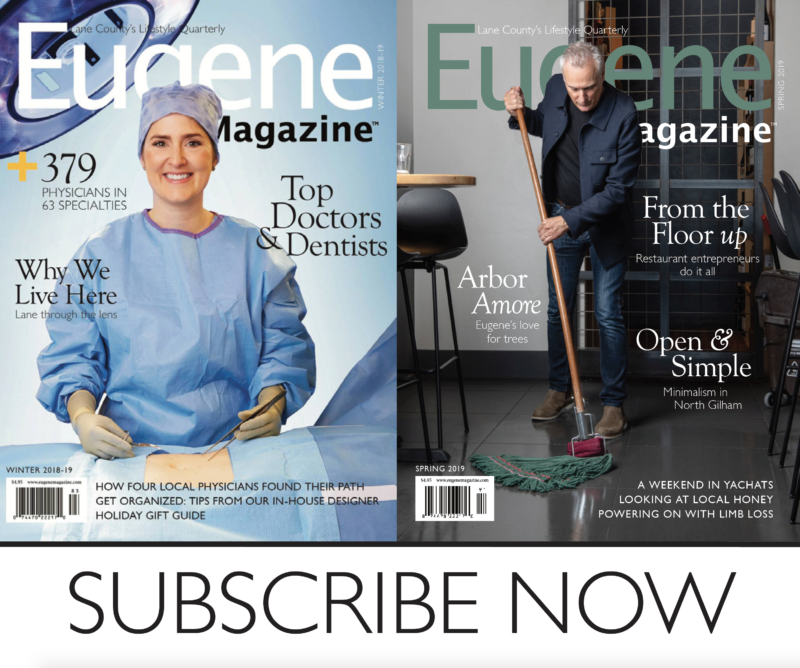 Eugene Magazine caught up with a handful of notable folks with Eugene connections, people making their mark on the world while playing by their own rules—a lot like Eugene itself. Korina Emmerich, born in Eugene, is a New York–based fashion designer who appeared on Season 13 of the popular reality show Project Runway. EM: How did your upbringing in Eugene lead you into the world of fashion? KE: Eugene is such a special place. I’m so grateful for being raised in an environmentally and culturally aware place. The abundance of arts and crafts has absolutely contributed to my life in the arts. EM: Your Native American heritage inspires a lot of your design work. How did Eugene help you explore this side of yourself and your family? KE: I loved the way Eugene really celebrated culture and diversity. It was such an integral part of the school system. My favorite school memories were when NASU (Native American Student Union) hosted powwows. I was a jingle dress dancer, and interestingly enough, my jingle dress was the first dress I ever made! I know that directly contributed to my career path. Living in New York City now, I am so overly aware of how lucky we were to be exposed and educated on so many cultures. Terri Irwin is an American-Australian author and naturalist. She owns the Australia Zoo in Beerwah, Queensland. She is also the widow of popular naturalist and TV personality Steve Irwin. She was born in Eugene. EM: Eugene is known for its natural beauty. How did growing up here inspire your passion for the natural world? TI: My friends and I were truly “free-range kids.” Summers were spent bicycling around Alton Baker Park or hiking up Spencer Butte in the hopes of catching a glimpse of one of the shy rattlesnakes that sought refuge in the rock escarpments. Winters were spent hoping the Willamette Valley would get snow. I was very fortunate to have supportive, encouraging parents. I think my dad believed that I could do anything I set my mind to, and he taught me so many life lessons. Dad used to drive a heavy-haul truck (among many other jobs), and he would bring home wildlife that he found injured or orphaned on Oregon’s highways. He taught me that taking the time to help another living being was essential. We would rehabilitate the hapless animal until it was fit to return to the wild. I really think that this lead me to one day run wildlife conservation projects around the world. Jordan Kent moved to Eugene in 1997 when he was 13 years old. He played football at the University of Oregon, and in 2007 the Seattle Seahawks drafted Kent as a wide receiver. He now works for Comcast SportsNet and runs youth sports camps around the state of Oregon. EM: From Nike to Ducks football and TrackTown USA, Eugene has a long history of athletic excellence. How did growing up here lead you to a career as an athlete and sports broadcaster? JK: Without a doubt my athletic experiences in Eugene, and the support I received in high school and in college at the University of Oregon, placed me where I’m at today. The connections, relationships, and experiences I had in Eugene have allowed me to grow into my career and have opened many doors for me. It goes back to the strong sense of community where Eugeneans truly want to help and support each other throughout their lives. What stands out to me the most about Eugene, as I look back, [is] the sense of community I felt. There were so many things that brought everyone together, whether it was the Oregon Ducks, a passion for the outdoors, the pride in being TrackTown USA, that it always felt like a “big little city” where everyone knew each other. Halie Loren is a Eugene-based musician and jazz singer. Her work has topped charts in Japan and Canada. She moved to Eugene as a teenager and continues to call Eugene home. EM: Eugene is recognized nationally for a rich and diverse music scene. How did Eugene help launch your career in music? HL: Connecting with local musicians from a young age and growing within the local music scene was enormously impactful in my development. My core collaborators, many of whom I first began working with and learning from during those early days (such as pianist Matt Treder, bassist Mark Schneider, and drummer Brian West), are fellow Eugene musicians. We have such a wealth of fantastic musicians and artistic mentors in this city. The Eugene Celebration and the Willamette Valley Music Festival in the early 2000s are some of my favorite memories from my early days in Eugene—those events really helped foster a sense of community for me, and made me excited to be a young musician in such a vibrant arts culture. I’ve toured around the world frequently in the past seven years, and I get a renewed sense of gratitude for my beautiful hometown each time I come back. Jenny Wade is an L.A.-based actress known for her roles in the FOX TV series The Good Guys, the CW series Reaper, and in the Feast film series. She was born in Eugene in 1980. JW: I think I was part of the last generation of completely unsupervised outdoor kids. And to have that experience in Eugene, during those years when the city was much less developed, was fortunate, I think. During the summer months, I was in the fields behind my house with the neighborhood kids from sunup until the streetlights came on. We picked filberts, plums, cherries, and blackberries and ate them in the grass. We had water balloon fights and bike races and caught tadpoles with tiny nets; always barefoot, plenty of bee stings—tomboy heaven. EM: How did your time in Eugene help you discover your passion for acting and theater? JW: I will always love my high school drama teachers Alan Aldrich and June Terry. Mr. Aldrich created such a safe place for me—a place I always felt confident would exist no matter where I went. He changed my life—but not in a career-defining way. He just showed me so much love there during a time when I really needed it. Lafa Taylor is an Oakland, California–based hip hop and electronic musician who got his start in Eugene. He has toured all over the world, collaborated with artists like Bassnectar, and performed at world-famous music festivals like Coachella. EM: What are some of your earliest memories of Eugene? LT: I have so many great memories of Eugene! Jumping off of the high dive at Amazon pool (which was incredibly scary at the time); trick-or-treating at the “Jones” mansion off of Chambers and getting to grab as much candy as I could hold in one hand; running around the Saturday Market drinking strawberry lemonade and eating pad thai; trips to Fall Creek in the summer. I could go on forever. EM: Did growing up in Eugene help launch you in your career as a musician? LT: Absolutely! I feel very fortunate to have been raised in Eugene. Meeting like-minded kids growing up started me on my path making music. Being raised around such beautiful nature gave me my love for the outdoors, and being surrounded by so many unique people made me proud to be different. Tracy Bonham is a Grammy-nominated musician from Eugene. She is best known for her ’90s-era hit “Mother Mother,” from her breakthrough album The Burdens of Being Upright. EM: What is your favorite memory of growing up in Eugene? TB: My favorite childhood place to go while a teenager in Eugene was the Bijou Art Cinema. I always loved seeing independent movies there. I saw my first Alfred Hitchcock movies there, as well as the Talking Heads’ Stop Making Sense—all memorable experiences for me. EM: You did some community theater while in Eugene. Did this help launch your career in music? TB: I will never forget when Joe Zingo (director, Actors Cabaret of Eugene) came up to me and told me that he saw the magic in me while I was just an extra in the chorus of My Fair Lady. My amazing music and drama teachers from junior high and high school set me on my current path, along with the talent and encouragement from my parents and their circle of friends. I was fortunate to grow up during a time when arts and music programs in the public schools were much more vibrant than they are today. I truly hope kids nowadays can have those kinds of guardian angels in their lives. RJD2, born in Eugene, is an independent hip hop and electronic musician based in Columbus, Ohio. His work is featured in the opening credits of the popular AMC cable network show Mad Men. EM: Your time in Eugene was relatively short but your memories are vivid. Can you share some with us? RJD2: I was born in Eugene, lived there for a year or two. My mom likes to say that I was born in the middle of a big storm in the Eugene hospital. I do have pictures somewhere of me crawling around on the floor of the WOW Hall, as my parents were performers and rehearsed in that space after I was born. We settled in Columbus, Ohio, when I was around 4 years old; there was a period of time where we traveled the country between Eugene and Ohio, living out of a converted UPS truck. I would say this: The time I spent in Eugene was a product of my parents being traveling performers, which did inform my path in life in ways. Justin King is a world-renowned musician and photojournalist who recently moved home to south Eugene, along with his band King Radio, after running a recording studio in Brooklyn, New York. His family has owned and operated King Estate Winery for over 25 years. EM: How did Eugene’s access to the outdoors and fostering of creative endeavors influence you as a kid? JK: I spent a lot of my childhood in the woods. Building a tree house, hiking up to see the view from Spencer [Butte], or just taking a guitar out to a beautiful field somewhere—such an amazing environment to grow up in. Living in a region that generally practices organic/responsible agriculture, and having access to that kind of produce, is something I surely benefited from as a growing kid. Another formative aspect was the emphasis on arts that still seems to be part of the fabric of life in Eugene. I think we do a lot to foster creativity here, it has become part of our identity, and that’s something I think we can be very proud of. Eugene pushes me out for a while and then pulls me back again, and this relationship has worked for us. However, the desire to permanently leave again is feeling further away all the time. I am lucky and thankful to be part of this community. Norma Fraser, born in Jamaica, is a legendary reggae and ska musician who at one time recorded for the immortal Jamaican record label Studio One. While based in Eugene, Fraser continues to perform all over the world. EM: Eugene, like much of Oregon, is not particularly known for racial diversity. However, you feel overall that Eugene offers a welcoming environment. Can you explain? NF: Eugene’s community “live and let’s live” attitude and nonjudgmental outlook have made me more introspective—a great change breaker for me. I have become more spiritual as a result, and a musical activist for change regarding the human condition. Eugene’s emphasis on having bike paths and lovely parks is a treasure. My ability to walk around and be “normal” and participate unimpeded without being treated like a celebrity is wonderful. I’m shown a lot of love, and I return it in kind. Curtis Salgado is a renowned blues and R&B musician who grew up in Eugene and is now based in Portland. His 2016 release, The Beautiful Lowdown, is out now on Alligator Records. EM: How do you feel things have changed for kids growing up in Eugene compared to your experience? CS: For me, the Lane County Fair was a big event. When I became old enough to go to the fair by myself, it was kind of a tradition to work for the money that you would spend at the fair, and to help buy clothes and supplies for school that was soon coming up in September. So kids from all over Eugene and Springfield and the surrounding towns would wait at a designated place in their neighborhood for a bus to come by to go pick beans or strawberries. One of the farmers that had a bean field was named Chester Crowson. He would personally come by our house in a huge dump truck and pick my sister and I up to take us to the bus stop. I got a kick out of that, and I thought it was the coolest thing. Life for kids has certainly changed! EM: You tour all over the country. Is being from Eugene still important to you? CS: Every night when I introduce the members of my band, I tell the audience what city they come from. When it comes to introducing myself, I tell them I come from Eugene, Oregon.